A depressed mother, deceased father, and unrelenting bully make life seem bleak for 11-year-old Finch, but a new neighbor allows her to shine again. Finch's father died from cancer, and her mother seems to have let her joy die with him. Finch struggles to make sense of her new reality, in which her mother smokes all day and her brother's new friend, Matt, bullies her every chance he gets. 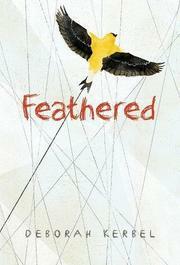 When Pinky Nanda and her family move in next door, Finch finds someone who also knows what it's like to be different. As Pinky and Finch's friendship grows, their sense of alienation is replaced with hope. But Pinky's Hindu family is reluctant to trust the acceptance of Finch or any other outside their culture. When the Nandas' fears threaten to tear her and Pinky apart, Finch shows Pinky that she belongs. Finch's present-tense narration allows readers to see the world through her eyes. Kerbel does not make her wiser than her years or unusually exceptional, which will be a relief to anyone who struggles to feel normal. As the story unfolds, Finch, a white girl, learns more about what being Other means for herself and for Pinky in small revelations. These moments build into a satisfying crescendo, each character growing not by leaps and bounds but with a steady pace.